Most visitors to the Louvre know that finding the best Louvre entrance is paramount. We’ve all heard the same horror stories of having to wait in line for hours outside on your feet, sometimes in the rain, before even getting inside. After all of that you’ll still have to go through security and the ticket lineup before you’ll be allowed into the galleries. The museum has over 8 million visitors a year and is always busy. Without making the right preparations, visiting the Louvre can turn into a big hassle instead of a pleasant outing. If you’re wondering about the best way to access the Louvre, this is the guide for you. Below you’ll find information on the best Louvre entrance, when to go, how to get there and so much more. We’ll also tell you the best way to get your tickets and some easy tips to help you avoid long line-ups while you visit Paris. For even more information on how to plan your visit, what to see inside, and other helpful tips, check out our complete INSIDR guide to visiting the Louvre museum in Paris. On a busy day the average waiting time is about an hour long. Especially if you are entering through the Pyramid entrance. If you enter by Carrousel du Louvre it can drop to 10 minutes! Choosing your entrance and the time of your visit when visiting the Louvre is really important. In order to get in the museum even with a ticket of a museum pass, you will have to go through security. All bags are checked and large items are not allowed inside the museum. You will be asked to leave at the cloakroom located in the main hall underneath the Pyramid and which is free. Also you can save a lot of time if you have already purchased your tickets. Sometime the line at the tickets stand can be a little long and there are tickets holder lines which can make you cut some waiting time! Keep reading to learn about buying your tickets in advance and all the options available! Individual visitors or small groups can access the Louvre through any of its entrances apart from Porte de Richelieu which is reserved for tour groups and museum membership holders. The main Louvre entrances are the Pyramid, The Carrousel du Louvre and the Porte des Lions. If you’re arriving to the museum by metro, the closest entrances are the Pyramid and The Carrousel. 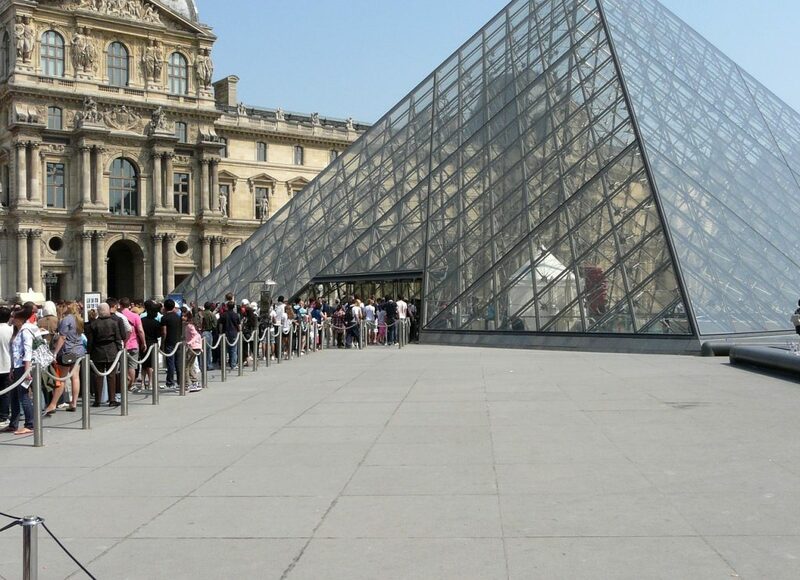 Since many want to check out the Pyramid before heading inside the Louvre, this is usually the busiest entrance. Whichever entrance you choose, make sure you book your tickets ahead of time to avoid long lines. If you’ve arranged to visit the Louvre with a tour group, you can access the museum through the Porte de Richelieu. This entrance is specially designated for tour groups to ease foot-traffic at the museum’s other entrances. You can also enter the Louvre through the Porte de Richelieu if you hold a Louvre member pass. If your staying in Paris for any extended period of time and plan on visiting the Louvre more then once, you will absolutely want to invest in a membership. The standard adult pass is 80€ and gives you unlimited, free priority access to the museum as well as discounted admission to over 100 other French museums. You can also bring a friend for free on Wednesday and Friday evenings after 6 p.m. when the museum is open late so guests can take in the Louvre museum at night. Learn about the Annual Suscription Pass on the Louvre Official Website. 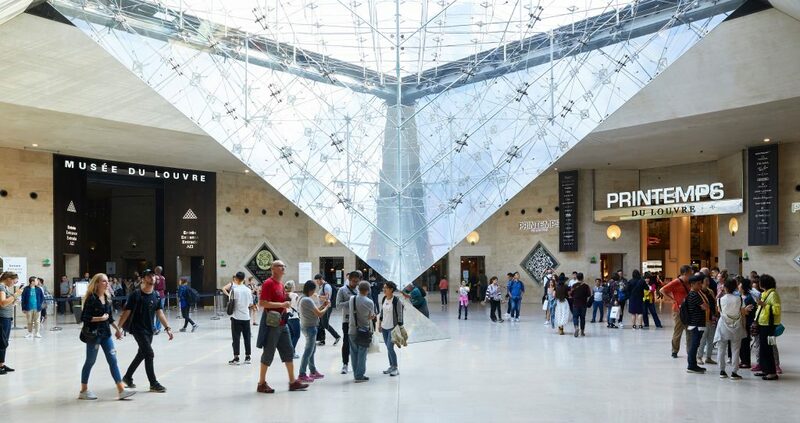 For disabled visitors, the best Louvre entrance is the Pyramid entrance or the entrance in the Carrousel du Louvre which both have elevators to take you inside. Between the two, we recommend the Carrousel du Louvre entrance where you won’t have to navigate through as people as you make your way to the entrance. Another plus: this is an indoor entrance so you won’t be forced to deal with the elements while you’re waiting to get inside. An accessibility guide to the Louvre can be found here on their official website. The museum also offers accompaniment for disabled patrons who wish to reach The Touch Gallery, the Carrousel parkade and the nearest taxi stand. La Pyramide is the main Louvre entrance and as such, it’s usually the busiest and most hectic entry point to the Louvre. If you don’t buy your tickets in advance, on a Monday in high season, you can anticipate standing outside for a good three hours waiting to get in. Even with a ticket purchased in advance you can still face long wait times at this entrance. If you’re set on seeing the pyramid, you can take a quick stroll through the palace courtyard and snap a pic in front of the striking glass entrance before heading to one of the Louvre’s other, less hectic entry points. Carrousel du Louvre is probably the best Louvre entrance with the shortest waiting times. The Carrousel is underground which connects the mall and its great selection of shops and diverse restaurants with the museum. It’s a great place to shop or grab lunch where you’re guaranteed to find a wide selection of affordable food and cool stores. Apart from the shopping and dining, we love the practical services that are traveller-friendly. They even have a welcome desk where you can fire away with your questions about traveling in Paris. Carrousel du Louvre can be accessed from metro station Palais Royal-Musée du Louvre on lines 1 and 7 or at the above ground entrance at 99 Rue de Rivoli. A great place to grab lunch before or after your visit or to pick up a souvenir from French favorites like Fragonard fragrances and Ladurée macarons. Other than the Carrousel du Louvre, the Porte des Lions Louvre entrance is likely your best bet to avoid hours-long wait times to access the museum. The Porte des Lions entrance is also the closest entrance to the Mona Lisa, so if you’re planning on centering your visit to the Louvre around Da Vinci’s mystery lady, this entrance is the one for you. The Porte des Lions Louvre entrance is located at the South end of the museum which runs parallel to the Seine. It can be accessed from the neighboring Quai François Mitterrand. The Louvre entrance at Porte de Richelieu is reserved for designated tour groups or for those Louvre visitors who hold member passes. If neither of these categories apply to you then you’ll need to choose a different entrance to access the museum. To those who qualify, the Porte de Richelieu Louvre entrance is located in Passage Richelieu, the avenue to the north of the pyramid that links the palace courtyard with Rue de Rivoli. If you want to do a group tour of the Louvre, you can reserve spaces on the Louvre’s official website. You will have the option of taking a tour with an official Louvre tour guide or you can hire your own and reserve a time slot to visit the museum together. An important note: to qualify as a group you must have a minimum of seven people and a maximum of twenty five. 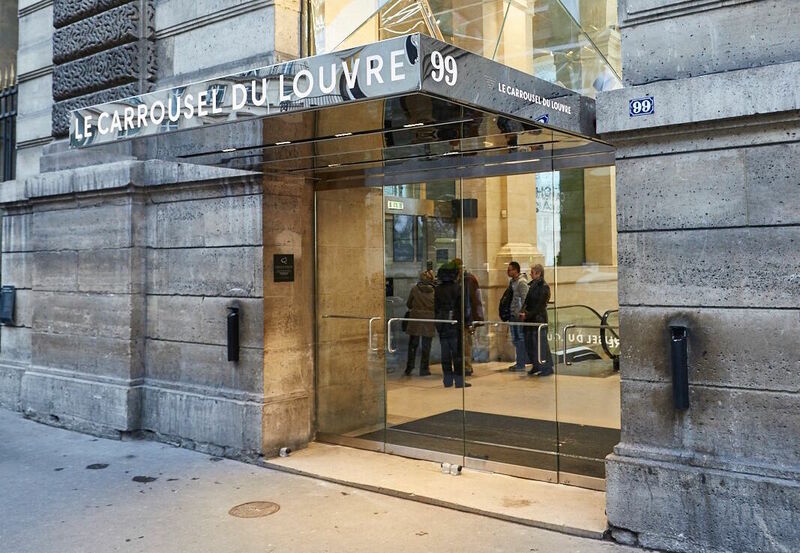 Carrousel du Louvre is open everyday from 10:00 a.m. to 8:00 p.m. The welcome desk at the entrance that is in partnership with the Paris Tourism Office will support you and provide useful information in many languages. You will also find an ATM, phone charging stations and clean public bathrooms. For those who are excited about going on a shopping spree, don’t forget that you can get a direct tax refund at Carrousel du Louvre. Just make sure you collect all of the receipts from where you shopped inside the mall. If you’re running low on euros, you’ll easily find their on-site currency exchange service. Paying by credit is also convenient as they accept all major payment networks including AliPay and WeChat Pay. Carrousel du Louvre is a great place to have a coffee break or a breakfast before your visit to the Louvre. With all the restaurants available, it is very convenient to grab a bite to eat there. With mid-range and affordable options great for everyone. You will find great French designers’ stores like Maje, Sandro and Lancel which are Parisians’ favorite. 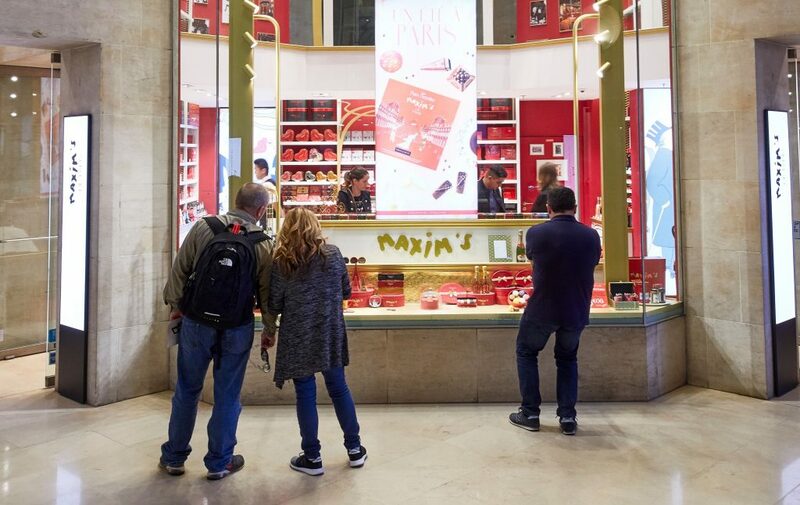 It is also a tremendous spot for Gourmet Souvenir shopping with Ladurée Macarons, chocolates from Maison du Chocolat and fine French specialties from La Comtesse du Barry. All the nicest French beauty brands have dedicated stores: L’Occitane, Caudalie and Fragonnard should be on your shopping list on your way to the Louvre Museum. For a complete list of the shops, click here. Whichever Louvre entrance you decide to use, make sure to buy your tickets online before you go. If not, you can expect to wait in line for two or even three hours before you get inside. Tickets are available for online purchase via the Louvre official website. However, we recommend using Tiqets.com, a service that sends your tickets directly to your smartphone after purchase. When you use Tiqets.com you can choose your arrival time and are guaranteed a maximum wait time of 30 minutes. They’ll also give you a free audio guide to the museum. This is definitely the easiest and fastest way to access the Louvre Museum. If you are planning on visiting a few museums during your stay in Paris, the Paris Museum Pass is a must-have. 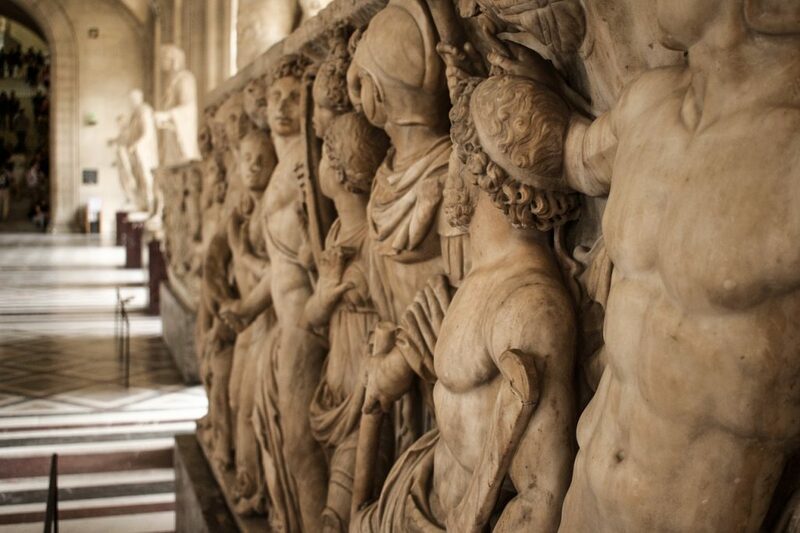 The Pass, which goes for about 50€, give you complete unlimited access to over 60 museums and monuments. 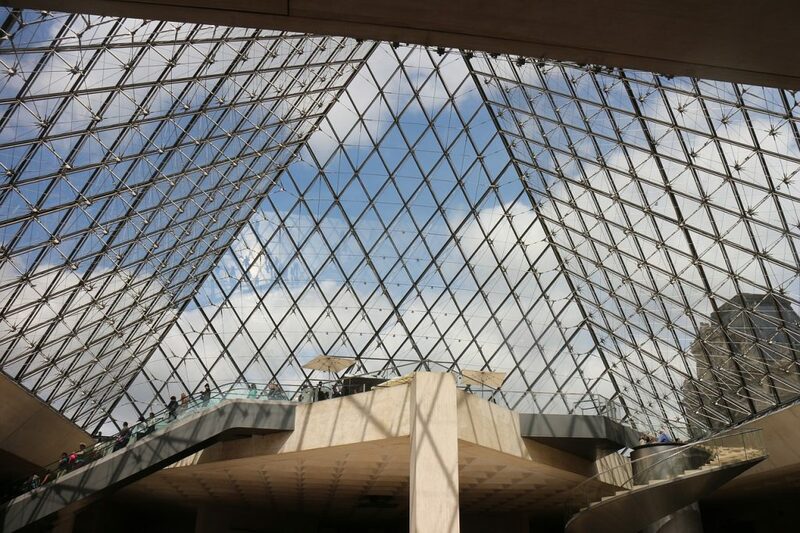 You’ll also get priority access to the Louvre with their ‘fast-line’ located at the Pyramid entrance. There are similar priority access lines for Paris Museums Pass holders at other major museums like L’Orangerie and the Musée D’Orsay. There are reduced pass prices for children and teens so if you travelling as a family this is a great way to save some cash. Paris Museum Passes are available for purchase on their official website and through official partners. 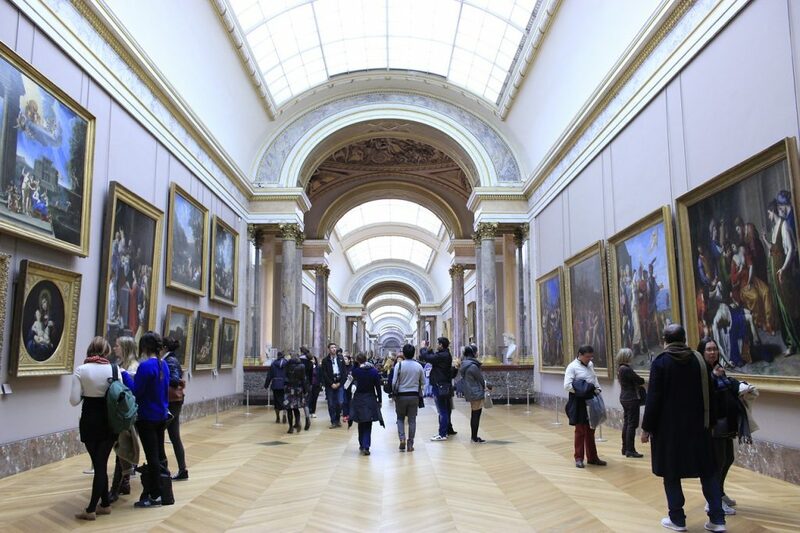 Get all the info you’ll need on the Paris Museum Pass. And for everything you need to know about the other great museums you’ll be able to access with the pass, check out our full Paris Museums Guide. If you don’t want to foot the 15€ ticket fee and don’t mind a crowd, there are several days during the calendar year when the museum offers free admission to all visitors. On the first Saturday evening of every month the Louvre offers free admission to visitors between 6:00-9:45 p.m. On France’s national day, Bastille Day (July 14), the museum also opens its doors free of charge. During the museum’s extended evening hours on Friday nights from 6:00 to 9:45 p.m. the museum is free for people under 26 years of age. If you are a teacher of the arts or art history you are also entitled to free Louvre entry at any time. Learn more about visiting the Louvre at night. If you won’t be able to visit the Louvre on one of its free-admission days, there are a few other ways to qualify for free entry to the museum. If you’re a student under the age of 18 with a valid student card you can access the Louvre for free at any time. The museum is also free for EU residents with valid ID between the ages of 18-26, persons with disability and those accompanying them. If you’re a member you can always access the museum free of charge but are restricted to the permanent collections. In the Richelieu Wing you’ll find the Napoleon III apartments, French sculptures from 500-1850 and the museum’s complete collection of Near Eastern Antiquities. We love the antiquities collection where you can see centuries-old weapons, household items and decorative arts originating from areas between Northern African and Central Asia. The entrance to the Richelieu Wing can be found tucked between the museum cafe and public restrooms on the Northern end of the entrance hall. Be sure not to confuse this entrance with the Passage Richelieu which is an above ground corridor that connects the palace’s outdoor square with Rue de Rivoli. The Sully Wing is the oldest part of the Louvre palace. Here you’ll find information on the history of the Louvre as well as the Great Sphinx of Tanis which is itself over 4000 years old. 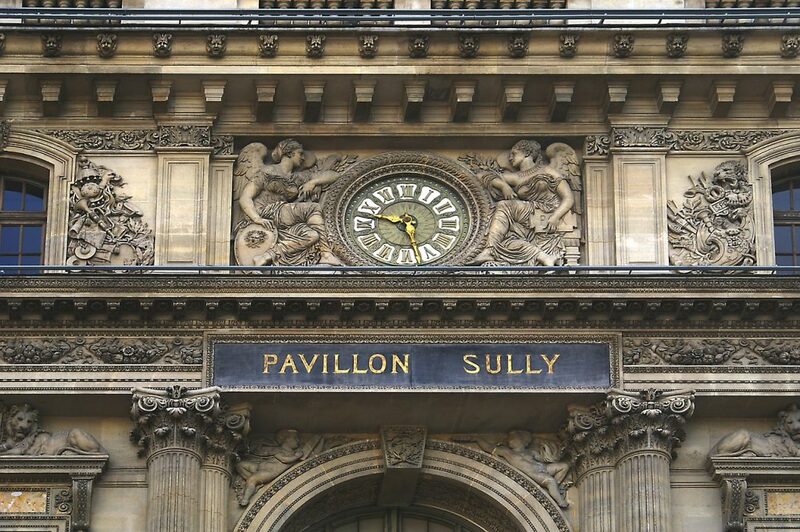 The Sully wing also houses a large portion of the Louvre’s collection of French masterpieces including works by Rubens and French neoclassical painting such as Jacques-Louis David’s ‘Coronation of Napoleon’. The entrance to the Sully wing is at the West end of the entrance hall directly across from the museum’s information desk. In the Denon Wing you’ll find the museum’s renowned Italian and French collections that include Da Vinci’s Mona Lisa and other celebrated works. The Denon Wing is also the home of the Venus de Milo and the majority of the Louvre’s collection of Greek, neoclassical sculpture. You can expect to leave the Denon Wing an expert on the Italian Renaissance and Grecian antiquities. The Denon Entrance is located inside the Louvre across from the cafe on the southern end of the entrance hall. As a sucker for a good gift shop, I can tell you that the book and gift store at the Louvre does not disappoint. They have a huge selection of books on a variety of art topics and a beautiful selection of house wares, accessories and other gift store standards. The shop also has a lounge area so it’s a great place to stop for a break and browse their selection after walking through the museum. The gift store is open daily (except Tuesdays) from 9:00 a.m. to 6:00 p.m. The gift shop is accessible by Carrousel du Louvre entrance.